Friday - hoped to have a nice sail down to Grand Harbour, breeze was looking good E12 as we left Mgarr - once out on the North shore it faded and we motored to Grand Harbour. Great berth on B dock beside the street. 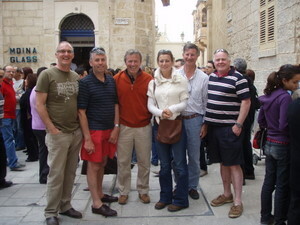 Joined by John De Giorgio, Monique, Robert Ciantar & Louissa for drinks then into Valletta to Ambrosia run by Christopher Farrugia, a good friend of some Bermudian friends. Great bistro like setting just around the corner from from the cathedral. Christopher did the ordering - lots of shared plates, a bit of bunny here and there - absolutely fabulous. 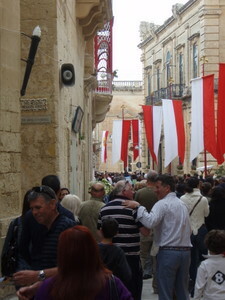 Saturday - toured Valetta then back to the boat to rest up and a bit of liars dice. 2200 off to taste a bit of Paceville - a mob scene of + - 20 somethings. Sunday - met up with John & Monique to visit the President's summer residence - an old hunting lodge in the south east of the island. It was open for a special charity viewing. Nice group of local people there. Beautifully decorated. Lunch of bunny & chips in a beach restaurant overlooking Filfla Island - very Maltese. Walked around Medina on the way back - a festival going on - good fun. Back to the boat and dinner under the castle.